A few years ago, a professor in Girona gave a series of lectures where he scandalously argued that Don Quixote was originally written in Catalan before it was appropriated as the quintessential work of Spanish literature. 4 True or not, the book does provide a useful allegory of the present Catalan liberation struggle, in which noble hearts draw on a heroic past to clash with an unheroic present. “Don Quixote,” wrote Marx, “long ago paid the penalty for wrongly imagining that knight errantry was compatible with all economical forms of society.” 5 Now the knights and squires of Catalan independence are paying the price for imagining that national liberation struggles are compatible with all forms of society. To Quixote, the ideals and weapons of medieval romances seemed more solid than the upside-down world of early 1700th century Spain, unproductive and speculative due to the influx of cheap capital in the form of colonial silver. 6 But the ideas and practices of a world of small principalities failed spectacularly to comprehend or undo the symptoms of the crisis of a global empire. So to say the Catalan independence movement is Quixotic is not to suggest it has nothing to struggle against, but that it does so with ideals that have become abstract and formal, divorced from their material conditions. Behind the epic narrative of cultural and political resistance, Catalan independentism is deeply limited by the political economy, class composition and geopolitical intertwinements of Catalonia. The secession crisis of this autumn does not spring pristine from Catalan nationalism, nor from some ancient conflict with Spain. The context without which it would be impossible is the wider crisis of the Spanish state and the EU. The strategic and ideological orientation of independentism, though singular and irreducible, reveals that it responds to an interregnum experienced also, but differently, in well-established nation-states. The struggle in Catalonia is over independence, but its key term is sovereignty. As such, any assessment of the Catalan procès also has something to say about a political orientation that is emerging across Europe in very different, even opposed versions such as Brexit (Right-wing and anti-European) and Syriza (Left-wing and Europeanist). These politics cannot be described as different examples of the same species, say “populism,” but their shared invocation of national sovereignty does require a for now speculative explanation. In Spain, Catalan independentism is just one of several conflicting sovereigntist responses to the interregnum, others being the patriotism of Podemos and the Spanish nationalism of Rajoy. With its massive civic engagement and its institutional disobedience, Catalonia can be considered one of the most advanced examples of a renewed and so far unrealized politics of national sovereignty that is gaining traction across Europe in the crisis, from the establishment and far right’s attempt to activate nationalism to rebuild legitimacy and shift attention from the social question, to the left’s attempt to use the demand for national sovereignty as a cornerstone of its hegemonic project in times of neoliberalism. Unlike movements in already existing European nation states - with the exception of Greece until July 2015 - the struggle for sovereignty in Catalonia is driven not just by political elites, but also by mass activity. Yet like all movements for sovereignty, the constitution of effective popular power becomes secondary to the staging of “social majorities” in elections and referendums, and the solutions become dependent on the actions of elected politicians, who are granted the effective power of demobilization. The Catalan autumn invites reflection on the difficulties and limitations of the epic politics of national sovereignty in this interregnum. It is a strategic orientation that has produced Quixotes elsewhere, both more tragic and more farcical than Puigdemont, think of the figures of Tsipras and Farrage. But first and foremost, the Catalan crisis is an effect, accelerator, and perhaps ultimately a decelerator of the crisis of the Spanish state, and this is where the focus must lie. I write this as someone who spent the Catalan autumn in Barcelona, alienated yet affected, enraged and estranged. Every day police helicopters circling overhead stirred the blood of the city and tensed its tone. I saw one hundred military police in riot gear storm an election point and beat up voters, as well as a friend who had travelled from Madrid to put his body on the line in the protection of the referendum. In that situation, he was like so many others who inhabit Catalonia and the Spanish state: without a vote in either, and with a voice that speaks uninvited. My text emerges from this strange position, in hopes of estranging us from the spectacle and from the urgencies of actions in order to focus on their conditions. It is guided by the words Walter Benjamin chose to describe Brecht’s subversion of the epic genre: “Instead of identifying with the characters the audience should be astonished at the circumstances under which they function.” 7 The first step is a deflation of the epic. For a period, the favorite mainstream reference for independence was Scotland and Quebec, two regions who undramatically were conceded the right to self-determination in referendums in 1995 and 2014. Votar és normal, voting is normal, as a slogan had it. But references to more epic, even insurrectionary struggles of national liberation have always been made in the Catalan context, and they are becoming more common. In 2014, for instance, a flurry of exhibitions and publications centered on the tri-centennial of the Catalan independence declaration of 1714. On the independentist left 1934 is held dearer, through parts of the narrative tend to be downplayed, particularly the fact that the short-lived 1934 Catalan republic was declared in the context of insurrections across the state, most significantly the two week commune of Asturias, and called for a federation of Iberian republics. It has by now become common 8 to subvert these solemn invocations with an apt reference to Marx’s dictum that all great world-historic facts and personages appear twice – first as tragedy, then as farce. The October 2017 declaration of independence, vaguely formulated and never acted upon, stands in for the deadly repression of the 1934 Catalan Republic. 9 Then, president Companys was imprisoned by Lerroux and executed by Franco. Now, in a toned-down reboot, President Puigdemont was chased to Brussels by Rajoy. And indeed, the farce becomes total when Rajoy, leader of a deeply authoritarian party mired in corruption, sends thousands of police officers, hosted in a cruise ship covered in Looney Toons characters, to beat up voters in Catalonia to ”restore legality and democracy.” Similarly, Carles Puigdemont’s twists and turns, his two-second declaration of independence, his last-minute changes of heart, and his flight to Brussels have all been rich sources of satire - though his possible 30-year sentence is not. Of course, Puigdemont’s Catalonia is nothing like the Guinea Bissau of Amilcar Cabral or the Algeria of Ben Bella, as acerbically noted by Madrid-based historian and sociologist Emmanuel Rodríguez. 10 But, hyperbolic appropriations notwithstanding, the Catalan independence struggle does have one thing in common with other struggles of national liberation: to succeed it must produce, as Frantz Fanon wrote, a manichean division along national lines, strong enough to force a positive answer to the question “yes or no to independence.” For Fanon, this is the labor of constructing a cohesive social majority out of everyday antagonisms and local and episodic struggles. In anti-colonial liberation, the decisive question poses itself in the everyday interactions between the colonizer and the colonized, providing the affective charge and existential necessities that need only find their political articulation. 11 In Catalonia, the national independence movement has weak roots in the everyday material struggles of people. Behind the manichean clashes of the Catalan autumn lies a motley assemblage of heterogeneous factors. Firstly, there is still strong historical memory of, and trauma from, the fascist extermination of the social revolution in Catalonia and the systematic attempt to repress and efface Catalan culture during the following dictatorship. Such memory of oppression functions as an interpretive framework for current events, one which is especially powerful when Spain is governed by the PP. As many Catalans will remind you, the PP is not a “normal” conservative party, but a Spanish nationalist party co-founded by Francoist politicians in a new democracy that failed to prosecute those complicit with the dictatorship. Secondly, support for independence is based on the community produced by Catalan institutions and civil society, from Catalan TV to the Catalan-language public school system and an ever more dense fabric of cultural associations. 12 The strength of Catalan language and culture, as well as its feelings of insecurity in the face of Spanish arrogance and non-recognition, gives the independence movement a strong ground in the cultural sector. 13 Thirdly, independentism is an articulation of a desire for more democratic control and accountability, in relation to the wider crisis of legitimacy of the Spanish state and economic model since the onset of the housing crisis in 2008. Finally, it is a reaction against the arrogance and corruption, as well as the centralizing and authoritarian tendencies, of the PP, which has been ruling Spain since 2011. Support for independence has only approached a social majority beginning in 2012, after the onset of the economic crisis and under the PP government. This is of crucial significance. Because at their root, the most dynamic factors of the movement, those grievances capable of spurring a critical mass into action, are not specific to Catalonia, but rather belong to the entirety of the crisis-ridden Spanish state. Thus, the current Catalan secession crisis is a product of the crisis of the constitutional order of 1978, and independentism is merely one of the responses to this crisis. This too belies the invocations of anti-colonial struggles. Such hyperbole is deeply and sincerely felt, partly because the arrogance of the PP government has specifically targeted Catalonia and tried to mobilize voters around anti-Catalan Spanish nationalism, and partly because the insurgent nationhood of Catalans seems to open a way out of the deadlock of the ossified régime of the 1978 Constitution and towards a republic, more social and democratic than the current order. Seen through the prism of Catalan history, these factors explain much of the international left wing fascination with the Catalan fight and its readiness to narrate current events – messy, contradictory, farcical and divisive as they are – in an epic mode. In this linear story, the Catalans are the collective hero who, against all odds, has now arrived at the urgency of the final battle. The story I want to tell here is more profane, more broken, more surprising. Outside of Spain, a common defence of the PP government’s unwillingness to negotiate Catalan separatism references its economic and political costs. Catalonia makes up about 20% of the Spanish GDP (those 20% are the equivalent of South Africa’s GDP) and, without the region, the Spanish debt-to-GDP ratio would skyrocket along with borrowing costs. 14 At the same time, the warning goes, any concession to Catalonia would reignite separatist ambitions in the Basque Country. However, such explanations are beside the point, because the Spanish blockade goes back to before the growth of separatism. It relates to the absolute refusal to grant Catalonia increased autonomy which, if conceded, would have cut support for independence in Catalonia decisively. Since its inception, Catalanism has been “a byword for moderation, caution and incremental change.” 15 As such, Catalanism was an expression of the wider political culture post-dictatorship Spain, during which a rapidly growing middle class distanced itself not merely from the years of fascism, but also from the social revolution it exterminated. It was a culture that accepted both the victory and the death of Franco, in order to let Spain enter into the new liberal European order. For decades after the transition to constitutional monarchy, Catalan nation-building, historical trauma and resentment were insufficient to gather anything near a pro-independence majority. Quite the opposite in fact; in 1977 when the fear of Francoism was still strong – perhaps precisely for that reason – only 5% of Catalans expressed a preference for independence. The dominant articulation of nationalism was “pragmatic Catalanism” rather than independentism. As noted by Kathryn Crameri, “one of the factors that has traditionally united political and civil nationalist groups in Catalonia is a reluctance to pursue the idea of a Catalan state.” 16 In those years, Catalan independentism was the minority position of a relatively weak left, particularly the historic center-left party of Companys, Ezquerra Republicana de Catalunya (ERC), as well as the small armed liberation movement Terra Lluire (“Free Land”). The latter dissolved in 1991, but alleged members of the organization were arrested and possibly tortured during Operation Garzón in the run-up to the 1992 Olympics in Barcelona. The current independence movement is rooted in the breakdown of pragmatic Catalanist strategies during the 2000s. From 1980 to 2003, Catalonia was governed by the center-right Catalanist party Convergència i Unió (CiU) under the leadership of Jordi Pujol. This party, a broad coalition between liberals and conservative and social Christian democrats, was welded under fear of the reemergence of Red Catalonia – in the late 1970s the combined vote of the social democrats and Communists had been close to 50%. The project - aided by state-wide electoral laws designed to promote a two party system and marginalize the communist party - suceeded. During Pujol’s 23 years in office, the main opposition party was the non-nationalist Catalan branch of the Spanish socialist party, Partit dels Socialistes de Catalunya (PSC), allowing CiU to dominate Catalan nationalism. The autonomy of Catalonia was occasionally expanded, and its institutions were allowed to reproduce and strengthen the imagined Catalan community. The political elites of Madrid and Barcelona found peaceful co-existence in a tacit pact of non-interference within each other’s spheres of influence, influence trafficking, and corruption. At the beginning of the millennium, the hegemony of CiU was strained by its support for minority PP governments in the Spanish Cortes. Backing the main party of Spanish nationalism was unpopular, but nonetheless grounded in CiU’s pragmatic tradition of seeking influence in Madrid. At the same time, the Catalan economy was experiencing a relative decline, transforming net transfers to Madrid and poorer regions of Spain into an issue of contention. 17 These developments created space for the surge of ERC. From this point onwards, competition between ERC and CiU over the nationalist vote created a more lively debate over Catalonia’s future and brought the discussion of independence back into the mainstream. In 2003, the PSC, heading the first non-CiU regional government since the transition, proposed a renewal of Catalonia’s Statute of Autonomy, the Estatut, which had been in existence since the transition. The aim was to secure a government alliance with ERC and stop the independentist drift of Catalan politics. But rather than dampen independentism, the attempted reform ended up accelerating it. After much debate and watering down, 18 the Estatut was voted through the Catalan and Spanish parliaments in 2005-2006 but was immediately suspended when the PP asked the Constitutional Court to assess its legality. 19 With the Estatut caught in a legal limbo, the question of independence began percolating into the general population, starting in 2006 with a demonstration of 200,000 organized by the ERC-dominated Plataforma pel Dret de Decidir (Platform for the Right to Decide). In 2009 and 2010, CUP were influential in setting up referendums on independence in a number of small municipalities, showing the movement’s increasing capacities. When in 2010 the court finally reached an agreement to reject many elements in the Estatut, a million Catalans came out in protest on the streets of Barcelona. Two years later, after Artur Mas returned to Barcelona empty-handed and humiliated from renegotiations with Spanish premier Mariano Rajoy (PP), 1.5 million of Catalonia’s 7.5 million inhabitants demonstrated on September 11, Catalonia’s national day. This time the demand was not for the implementation of the Estatut, but something much more radical: a sovereign Catalan state. The statistical record bears witness to a tectonic shift. In June 2006, 13,6% of people in Catalonia expressed support for independence, 31.3% for federal status, and 40.8% for remaining an autonomous community. In 2010 and 2011, support for independence went up from 20% to 28%, rising rapidly to 44% in 2012 before peaking at 48.5% in 2013. Referendum-style polls, in which options beyond yes or no are absent, showed 57% support for independence in 2012. 20 Humiliated by Rajoy and under increasing movement pressure, Mas moved the party of Catalan pragmatism towards independentism. The most radical aspect of the movement was its mode of organization, its assemblies, its contagious technopolitics, 27 and its processes of composition embedded in sectoral and everyday struggles, from the mareas (tides) in health care, education, social services and other sectors, 28 to neighborhood assemblies, and migrant solidarity networks. As the grammar of class politics had been liquidated in the previous decades, the 15M politicized what was at hand, the disappointments and anxieties of the children of the meritocratic and indebted middle class that had been the backbone of post-transition democracy. Taking their starting point in the reality of declassing, the most important movements of the period produced an interface between the downwardly mobile and those they met below, undoing many of the characteristics of middle class subjectivity, particularly the weighing of legality, individual independence, and respectability over informality, mutual aid, and collective struggle. Nonetheless, the movement system’s center of gravity lay with the middle class, and this introduced a tension between the radical democratic class practices and the desire to regain lost class positions or promises, through a reinvention of representative politics. The limits of the politics of sovereignty are always the same: the protagonism of the citizen and the forgetting of the immigrant, the prioritization of representative politics, and the instrumentalization or neglect of the construction of popular or class power. The dominant demand of the 15M, “real democracy now,” would come to play a major role in the construction of projects of popular sovereignty and citizenship, with its focus on the voter-citizen and electoral politics, and its exhausting campaigning cycles. Gradually, the content the struggle was hollowed out, in order to build “social majorities,” “govern for everyone,” and “include those that are missing.” 29 The roots of the “sovereigntism” in Catalonia, in Spain as elsewhere, lies in the crisis of the middle class. Quixote put on plated armor to regain through just deeds the class position and honor that was slipping away from his class, the hidalgos privileged by the state of his time yet owning little real property. Today, the crisis of the middle class is broadening the constituency for the discourse of national sovereignty, which in the past was its horizon of a social, but not too social state, which would secure dignified lives for its “productive” citizens. Perhaps because such a state has always been circumscribed by the Spanish state in Catalonia, the call for national sovereignty is more enchanting there. Mas wrote this after having implemented harsh budget cuts in the Generalitat and regularly deploying the Mossos d’Esquadra, the Catalan police, to tackle protesters. Fiscal sovereignty became the magic wand with which the Catalan élite tried to transform the critique of the banks, the real estate bubble, Troika-cuts, and their own neoliberalism into a critique of Spanish inefficiency and exploitation of Catalonia. True to the historical conception of the Catalan bourgeoisie, Mas’ CiU suggested that backward Spain was pulling down Catalonia, always considered more European and developed by the Catalan bourgeoisie. Adopting a left-wing version of this narrative, the Catalan left suggested that it would be easier to achieve a social republic in historically progressive Catalonia alone, rather than with catholic and conservative Spain. For the latter, foremost among them ERC and CUP, the crisis constituted a historic opportunity to achieve old aims, while the neoliberal Catalan right, tainted by economic mismanagement and austerity, embraced the quest for independence opportunistically as a source of renewed legitimacy. This uneasy alliance repeated an age-old particularity of Catalan politics, an effect of the political economy of consensus and contestation in a dominated territory. Because of its subaltern position with regards to the Spanish bourgeoisie, sections of the Catalan bourgeoisie have always supported the cause of autonomy. And because it never truly rules, it can take up progressive positions and make alliances with popular classes and left-wing parties at relatively low cost. 32Catalanism is the historical language of such class alliances, which are inconceivable in the Spanish capital. In this way, social discontent, opportunism, and thwarted desires for more autonomy mixed to fuel a broad independence alliance capable of mobilizing millions. This surge would have been unimaginable without the general fervor of the spring of 2011 and the accelerated crisis of the legitimacy of all ruling political parties, as well as the intransigence of the PP. In many ways, the polarization was fuelled by the PP government, which saw how a conflict with Catalonia (in which it has few and faithful voters) could position the party as the defender of Spanish unity in the rest of the state, and provide it with a winning card after years of corruption scandals and austerity. Activating stereotypes of Catalans as stingy, selfish, and arrogant, and spurred on by the anti-Catalanist party Ciudadanos (founded in 2005), the PP rallied support for their brand of authoritarian Spanish nationalism. In this way, there was a total blockade of an institutional solution to the Catalan question. The constitutional court blocked the prospect of any compromise within the constitution, while the Spanish government rejected not only negotiation, but also the idea of the Catalan government as an interlocutor on the question. The sharpening of contradictions was actively promoted. As an effect of these developments, a very large proportion of the Catalan middle class changed its allegiance from pragmatism to independentism. This significantly included a large section of the cultural élite, from academics and intellectuals to media professionals. 33 The professional middle class was crucial to the formation in 2012 of the biggest pro-independence civic association Assemblea Nacional Catalana (ANC) and the transformation of the old Catalan cultural association Òmnium into a pro-independence vehicle. 34 From then on, the question of independence was no longer mainly party political, and civic associations gave independentism an affective and social expression outside the calculations of parliamentary politics. However, the independentist left remained relatively weak in parliamentary terms, with ERC winning 7% and 14% in the Catalan elections of 2010 and 2012, and CUP entering the Catalan parliament for the first time at 3% in 2012 (in both elections CiU received 38-39% of the vote). Mas was increasingly moving contrary to the interests of a key constituency of CiU, that of Catalan capital, or at any rate the dominant larger enterprises within it, who consider independence a disaster. Gaining no concessions from Madrid and having unleashed a strong movement, there was no turning back. The only way to steer the movement was to raise the stakes. This process reached an initial culmination with the purely consultative independence referendum on the 9th of November 2014, in which “yes” received 81% on a meagre 39% turnout due to a boycott by anti-independence parties. Though symbolic and staffed by volunteers, the referendum was declared unconstitutional and thus illegal, and Mas was charged with perverting the course of justice, misuse of public funds, and abuse of power, risking a ten-year ban from political office. (Eventually he was banned for two years and fined 36,500 euros). The pragmatic mainstream liberal had gone rogue, and once more the constitution was wielded as a baton against Catalan ambitions. Presiding over the constitutional compromise was the European Community and its promise of membership. For the Francoist oligarchy and capital, democracy was an acceptable price to pay for access to European markets, while the socialist trade unions and left saw the EU (then EC) as a guarantor of democratic and economic development, and a way to marginalize the communist party. From 1978 until 2010 Catalan autonomy seemed to be gradually expanding, with no clear end-point in sight. From 1986, EU-membership gave many Catalans who mistrusted Madrid the confidence that their minority rights were guaranteed, and that the nation state would be gradually eroded in favor of a Europe of regions. With the Catalan economy and cultural development progressing, support for independence was low. Catalonia now shared a horizon of “modernization” with the rest of Spain: Europeanization. The question of sovereignty within the Spanish state was partially diffused by a transmission of sovereignty to the European level. For many years, the constitutional compromise gave the contradiction room to move, but its granting of nation-building capacities to regional governments was bound to run into conflict with its own insistence on the “indissoluble unity of the Spanish Nation.” 36 With the onset of the economic crisis, the stumbling blocks for compromise were no longer principally ideological, but also economic, pivoting on the question of economic sovereignty. Thus, in 2010 the constitutional court’s decision ended three decades of slowly incrementing Catalan autonomy and brought the contradiction to a head. Today, we are experiencing intensification of the constitutional contradiction between the accommodation of Catalan nation building, and the prohibition of Catalan nationhood. In the background of all this looms the various crises of the EU, which has resulted not so much in disillusionment and disaffection as in the anxiety that comes when a reference point and horizon is destabilized. However, in stressing the constitutional character of the problem, it is easy to lose track of contingency and thus of politics proper. Constitutional law is always a highly politicized matter, and in Spain more so than elsewhere in Europe. In a 2014-15 World Economic Forum survey, Spaniards expressed extremely low opinions about the independence of their judiciary, leaving Spain couched between Tanzania and Mexico at number 97 in a global index. 37 Further, as housing activists in Spain tirelessly point out, the constitutional court’s fervour is highly selective, knocking down regional anti-eviction laws in Catalonia and Navarra, while completely ignoring Article 47 of the constitution which guarantees all Spanish citizens the right to adequate and dignified housing, through the use of public works and rental controls. Even more to the point, the Basque country enjoys some of the autonomies denied Catalonia, including fiscal autonomy – simply because no one has dared challenge the Basque autonomy statutes, perhaps out of fear of reigniting the conflict there. Finally, the problem is clearly one of the political composition of the Cortes Generales, the Spanish congress, as constitutional changes are easier to make in Spain than in many countries. Thus, as late as in 2011, the required two-thirds parliamentary majority made a “balanced budget” amendment under Troika pressure, without bringing it to a referendum. The above explains why the question of a constituent process and constitutional reform has been alive in all of the Spanish state since the onset of the crisis, but also why the assault on la casta has taken precedence over the constitutional question outside of Catalonia. 38 In the cross-class alliance of the Catalan independence movement, on the other hand, the problem of constitutional change has become a project for a Catalan constitution. The problem of the casta has become the problem of the political élite in Madrid. When Podemos emerged in 2014 (it’s easy to forget how young it is), it styled itself as the political superstructure of the organized networks of the 15M and the broader movement ecology that had risen from struggles against evictions, unemployment, austerity, and corruption. Initially, Podemos was itself a network that let local “circles” maintain a high degree of locally embedded initiative. But the aim of its founders was always to give populist direction to one particular and influential demand of the 15M, that of real democracy now, which they construed as a project of reestablishing meaningful popular sovereignty, building on the famous populist hypotheses of Ernesto Laclau. Podemos, particularly after its transformation into an “electoral war machine” at the Vistalegre assembly in the autumn of 2014, moved away from the focus on the messy labor of composing and organizing people, towards a media-based strategy of discursive articulation and representation of the people. In effect, Podemos largely cut ties with the organic production of practices, solidarity, and “good sense” in order to reach out to the coveted apolitical but indignant middle class of which social majorities are supposed to be made. Where Podemos’ idea of the reinvention of popular sovereignty went through the state, the project of the comuns – and sister-projects in many Spanish cities including Madrid – was to root democratic institutions in local popular power; we might therefore speak of a locally rooted matriotism as opposed to Podemos’ populist patriotism. The municipalist movements eventually took over power in many cities, among them four of the five biggest in Spain (Madrid, Barcelona, Valencia and Zaragoza), and established a network of “cities of change” aiming for an incipient federalism from below. In terms of the national question, els comuns, represented on the Catalan level by first En Comú Podem then Catalunya en Comú, have stood stridently for the Catalan right to self-determination, without actively campaigning for or against independence – a difficult and principled position that has earned them titles both as traitors against Catalonia and criminal supporters of secessionism. 46 In the state-wide elections of December 2015 and June 2016, En Comú Podem won in Catalonia with 24,7% and 24,5%, as the only regions taken by the left besides the Basque Country. Apart from doing well in Madrid, Podemos and its various alliances did much better and superseded PSOE in most regions where Spanish/Castillian nationalism is challenged by regional identities, such as Navarra, Galicia, Asturias, and the Balearic and Canary Islands. Simultaneously with Podemos’ and Barcelona en Comú’s impressive rises, the polarization was deepening. The split between the independentist and non-independentist left, which has brought much bitterness, go back to two events in November 2014. First, there were the images of CUP-leader David Fernàndez embracing Artur Mas after the 9N referendum. Then there was CUP’s refusal to enter into the Barcelona en Comú confluencia, despite having taken part in the process that shaped its code of ethics. To non-independentists, these were serious signs that CUP was prioritizing the national question over the social one. On May 24th 2015, Barcelona en Comú won a stunning victory in the municipal elections. The CiU mayor Javier Trias, a gentleman from the posh neighborhood of Sant Gervasi, was replaced with the housing rights activist Ada Colau, who became the first female mayor in the history of the city. The vote showed a clear class polarization, with CiU taking the richest districts, and the Comuns taking the rest, winning with the largest margins in poorer neighborhoods. The advance of the comuns shook independentism. Polls suggested that a hypothetical “Catalonia en Comú” party could come close to displacing CiU as the largest party in the Catalan elections. The countermove came quickly: Òmnium and ANC, CiU, ERC and CUP attempted to set up a common electoral front “without politicians” to decisively make the upcoming election a plebiscite on the national question. In the end, Artur Mas refused to accept the faceless list, opting for a narrower alliance with ERC. 47 In one blow, the president decisively weakened and effectively sidelined the social agenda of Barcelona en Comú on the Catalan level, and the Comuns refrained from launching a last-minute candidature, their space taken by a smaller alliance, Catalunya Sí Que es Pot (CSQP), which included Podem. By only uniting the mainstream independentist parties under his leadership, ​Mas attempted to marginalize the CUP within the independece bloc, to undermine the autonomy of the ERC, and to avoid a confluence of parties and civil society which would have weakened his hand vis-a-vis ANC and Òmnium and his prominence overall. On September 27 2015, the CiU-ERC platform Junts Pel Sí (JxSí), won the elections to the Catalan Parliament. Winning a majority of mandates but losing the popular vote, the election clarified nothing. The independence plebiscite was taken to be a victory with argumentative sleights of hand: first, the independence bloc redefined “majority” in terms of seats rather than the popular vote, second it reasoned that since the Podemos coalition CSQP was neither for nor against independence, the yes side had a clear majority among the parties taking a position. Despite Mas’ maneuvers, the JxSí government could only come into being with the votes of the CUP, and this was to be the undoing of both Mas and the moderates in CiU. In January 2015 a government was finally formed. After much internal turmoil and a miraculous 1515 to 1515 assembly vote, the CUP supported a neoliberal-led Catalan government and its austerity budget. In return, the CUP received guarantees that a referendum would be held within 18 months, and secured the replacement of the tainted Mas by a truly believing Quixote, Carles Puigdemont: a CiU member and the president of Municipalities for Independence, who had cut his nationalist teeth campaigning for those arrested in the 1992 Operation Garzón. Podemos’ momentum stalled. In December 2015 they entered the Spanish Congress in third place, failing to overtake PSOE. In the re-elections of June 2016, Podemos failed to grow its vote, despite an electoral alliance with Izquierda Unida. The Catalan process pressed on. The prospect of constitutional reform receded, and the window of opportunity for an independentist rupture narrowed as the Catalan economy exited the worst of the crisis years. For the independence movement, the time for pushing the polarization to the point of a decision was approaching. The manichean phase would have to be traversed, Podemos and els comuns forced to take sides, and their projects sidelined. Catalonia has declared independence three times. Not just historically (1714, 1934 and 2017), but also this year. The first declaration of independence happened this summer, if only implicitly. In June, the Catalan parliament set a date for a unilateral referendum, and in early September it signed the Law of Transitional Jurisprudence, which would guide the transition until the creation of a Catalan constitution in the case of a yes in the referendum. Knowing that both the referendum and the transitional law would be deemed illegal and unconstitutional by the Spanish state, the Catalan parliament had chosen the path of institutional and civil disobedience. On a hot September day, about one million came out for the annual national day demonstration. While the Spanish government threatened repressive measures against these “illegalities,” the act of the Catalan parliament had already negated the constitutional foundation upon which their act could be considered illegal. When the foundation of existing law is rejected in the name of a new legality, there can be no legal mediation but only a clash of legitimacies, which can only be resolved by diplomacy or the use of force. This force was activated in the name of Spanish legality, on September 20. Fourteen Catalan officials were detained by the Spanish police for organizing the referendum, while civil society organizations were raided and thousands of ballots were seized and destroyed. The autumn was beginning. The second declaration of independence happened with the referendum of October 1st. Here, tens of thousands of Catalans occupied and spend the night at election points to keep them open for voting. Despite the violent deployment of 17,000 officers of the military police Guardia Civil, some 2.3 million voters managed to vote. 48 With the referendum, the Catalan government skillfully managed to weaponize democracy to polarize the conflict and force a decision. (As we saw, independence has only held majority support in polls that exclude a third, federal, option). Knowing that the referendum would inevitably be repressed by the uncompromising and authoritarian PP government, Puigdemont set the stage for a retrospective legitimation of the Catalan cause. The violent actions of the Guardia Civil made the point Catalan independentists have often failed to make convincingly: Spain and Catalonia are only held together by the threat or actuality of violence. On its side, the Spanish government, backed by Ciudadanos and PSOE, weaponized the empty signifier “democracy” in defence of repression: since the constitution is the legal ground of Spanish democracy, and the referendum is against the constitution, cops beating voters would only be considered a defense of democracy. Many, including Podem and Comuns, who had been neither seduced nor convinced by the independentist discourse, were forced by the repression to take sides in favor of the referendum. The repression also induced many unions with no position on the independence question to join the powerful general work stoppage on October 3rd. 50 However, true to their strategies and visions of popular sovereignty, they continued to reject a Unilateral Declaration of Independence (DIU). Yet the tenuous possibility of a pro-democratic front against Rajoy within all of the Spanish state was receding. The Catalan movement – reading all events through its increasingly Manichean spectacles – pushed on with its project of forcing a decision. ”To live is to take sides,” as a CUP slogan put it. Colau and Iglesias were left in a strange and increasingly unsustainable non-place, attacked by Catalan and Spanish nationalists alike and without a feasible short- or mid-term solution to the secession crisis. With the movement pressing on and the Spanish government rejecting all calls for dialogue, a hand-wringing Puigdemont came closer to declaring independence, one tactical pirouette at a time. Rajoy stood ready to pick up his baton of statesmanship: the revocation of Catalan autonomy and local democracy through the unprecedented invocation of the Spanish constitution’s article 155. In the last week of October both became real. The Catalan Republic was declared on Friday, took the weekend off, and was gone by Monday morning, except in the hearts of millions of Catalans, one of them a supplicant in Brussels. When Iglesias and Colau stood for the right to decide, they took the side of not only the 43-51% of registered Catalan voters supporting independence in various polls, but also on the side of the 82% of Catalans and 57% of Spanish voters supporting a referendum pactado, a mutually-agreed and legally-binding referendum. 51 After the referendum and still speaking to this majority, their slogan became “neither DUI nor 155.” But the majority itself was slipping apart, the center narrowing, especially when both the DUI and 155 became reality. Polls suggest there are majorities against both the DUI (58%) and article 155 (56%), but the overlap between these groups is only about 20%. 52 On the political terrain, Iglesias’ and Colau’s majority has slipped away for now, and their space of maneuver has been severely limited by polarization. Despite the arrests of a large number of Catalan politicians and the impending criminalization of the CUP, the independence bloc has committed to run in the enforced regional elections on December 21. The parties of the short-lived pro-democratic front are internally divided and without initiative. The radical independentist left affirms: the initiative for popular sovereignty is now with the streets. But “the streets” refers to the independence movement, rather than the popular classes. These are, as we will see, split by the national question, rather than united around the social question. Such is the effect of the double nationalist weaponization of democracy. The peaceful sedition of the Catalan government and the Spanish government’s violent repression of it produced a polarization previously unknown to most people in their everyday lives but palpable in a minutiae of daily interactions. Even one simple, neutral statement of fact – “so they declared independence” – was met with anxious neutrality from my fellow shoppers on October 27th. Many do not dare to state their colors in public. A friend of mine – not an independentist – has received death threats from Spanish unionists for criticizing the Spanish repression of the referendum in the international media. Spanish nationalists are emboldened across the country, and fascist street violence is increasing. Family relations are strained or worse. A comment on a friend’s Facebook-thread, which resonated with many, stated: “The worst thing you can say to many independentists is I feel I can not express my opinion. They get angry immediately. Yes, I am scared.” 53 The political conflict between the Catalan govern and the Spanish gobierno has carved a gash in society where there had hitherto mostly been disagreements. Contrary to the claims of liberal European opinion, the forces of Catalan independence do not express nationalist-chauvinist sentiments in the way that the official Brexit campaign did. In its official discourse, Catalan nationalism is not exclusive – and across the political spectrum you hear definitions of “Catalans” as meaning “all speakers of Catalan” or even “all inhabitants of Catalonia.” Defining Catalonia as a “land of immigration,” pro-independence demographer Andreu Domingo draws comparisons to the American Dream: “A Catalan is whoever lives and works in Catalonia, and wants to be one.” Of course, such statements not only romanticize America’s history, they also betray the reality of what the Barcelona migrant street vendors union calls “the colonial and racist Catalonia that excludes us, chases us and punishes us for having another skin colour, another language, another religion, another way of thinking.” 54 But it does express the mainstream multiculturalism of Catalan identity. In fact, the only major exercise in right-populist xenophobia in Catalonia was carried out by the ex-mayor of Badalona, the only PP official to take office in a large Catalan town. Catalan identity is rarely considered exclusive, with polls suggesting that three-fourths of the Catalan population feel both Spanish and Catalan, and only 19% feeling only Catalan. 55 However, even if the critiques of europeanist liberalism fail to their target when it comes to Catalan nationalism, so does the left’s description of the movement as a popular and bottom-up. 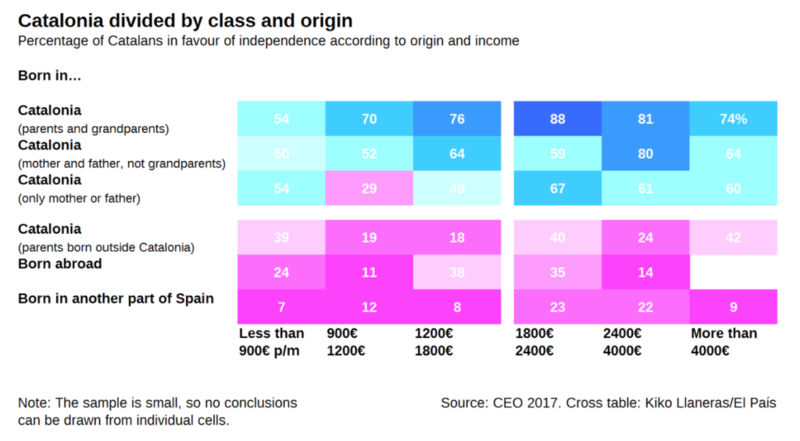 As we see, among those with Catalan family-background, support for independence grows with income, while pro-independence support is lowest among those that were born in the rest of Spain earning less than 900€. 57 Apart from the “troika of repression”(PP, PSC and Ciudadanos), the only party seeking to represent this category of traditional social democratic and communist voters is Podem/Catalunya en Comú. To outsiders, the most apparent divisions created in Catalan society are between ordinary Catalans and big companies moving their operations to the rest of Spain, and between a progressive, republican independence movement and local Spanish nationalists, among whom a vocal minority swears by Francoist flags and Hitler-salutes. But the demographically most significant divisions to be noted are between Catalans and non-Catalans, and between the working and middle classes. Just as the “lexit” (left-exit) campaign in Britain had to ignore the interests of the large European immigrant section of the working class, so too has Catalan independentism found its project of national sovereignty run into contradictions with the question of class-composition, particularly when we consider the popular classes in their heterogeneity. Far from the civil-war reenactment dreams of many international left wing spectators, Catalonia has seen indelible setbacks for the projects of solidarity developed in different ways by the PAH, 15M, and Barcelona en Comú. As we have seen, the roots of the independence process are not social grievances so much as political ones. In other words, the Catalan independence struggle is not the politicization and expression of social problems, but the socialization of political problems. For this to happen, social problems necessarily became subsumed and misrepresented in the independence process, and the cross-class project of Catalan independence was sold as a solution to the problems of the economic crisis and the crisis of representation. It is no surprise that morbid symptoms abound. The attempt to (re)establish sovereignty directs attention to the commanding heights of government and the theater of bourgeois politics. All eyes turn to the parties that might transform interregnum into regnum, and the restive energies of the moment start to work for (or on) their chosen leader. The Catalan movement found Puigdemont as its leader, and it is not surprising where he led it. But the interregnum is characterized by ungovernability – it creates a crack in political time, an opening for radical change. This opening depends entirely on people’s willingness to take risks, the strength of their ties of solidarity, and the urgency of their collective needs and desires. In the movement of the CDRs, these appeared to be strong. But since the movement’s aim was national sovereignty rather than popular autonomy, initiative lay with the government. And the government put down arms without resistance. The reasons range from the weakness of the claim of sovereignty, its lack of allies, and the composition of the movement itself. For all the invocations of sovereignty, all the referendum achieved was a spectacular show of opinion and will. Independence requires a government to have control over its territory and a capacity to defend it – or be under the protection of powerful nations. Of these conditions, only one was fulfilled in Catalonia. In the referendum, 2.3 million ballots were cast despite the total mobilization of the Guardia Civil. Spain was very far from exercising effective control over Catalonia. This could have been the starting point for a broader destitution of Spanish sovereignty in Catalonia, as Catalanism is very strong within public institutions, and as civil society and social movements in Catalonia are extremely well organized for contemporary standards. In theory, Article 155 could have been resisted through mass disobedience both in the streets and in the institutions. But Catalonia did not possess the capacity to defend itself. While unable to control the territory, Spain would have been able to arrest the Catalan government or render it inoperative. On the basis of popular autonomy, Catalonia might have been able to destitute Spanish sovereignty, without constituting its own. But without daring to pass through a phase of undecidability, the Catalan project of sovereignty could not realize its own majority, and eventually it submitted itself to existing legality. For Puigdemont, such a course was never planned for, both because of his fear of a rupture in legality, and because he believed the EU would come to his rescue. Throughout October, Puigdemont naively or disingenuously implored the EU to mediate talks with Rajoy. To do so would have required the EU to recognize the issues to be diplomatic rather than internal to Spanish jurisdiction, de facto recognizing Catalonia as a proto-state actor. This is a treatment the EU has been happy to extend to secessionist regions in its periphery such as Montenegro, Kosovo, and Slovenia (so happy indeed that it greets potential membership countries with strict criteria for the support of minority rights and democracy – the EU Treatise article 7 and the Copenhagen Criteria). But to think that the EU would treat Catalonia similarly – against the expressed interests of an EU-member country with powers of veto – is wishful thinking. If the EU did not respect the results of the January 2015 election and the July referendum in Greece, why would it act otherwise in response to the Catalan referendum? Indeed long before the referendum, the EU commission clearly signalled that Catalonia would have to reapply for membership to the EU and the euro. The ECB insisted that while independent Catalonia could continue with the euro, its loss of formal membership would also bar Catalan banks from access to central bank liquidity, resulting in large banks and companies relocating their juridical headquarters (if not their operations) outside Catalonia. In Catalonia as elsewhere, ”sovereignty” has become an empty signifier of the solution to the uncertainty of the interregnum, an affirmation of the need to “take back control.” The signifier will remain empty as long as it is a projection-surface and catch-all solution rather than a politically, socially, and economically feasible plan for the establishment of sovereignty. The Catalans cannot live on Catalanism, 58 and the limits of the independence process have to be found in the way Catalonia makes its living, profoundly integrated as it is with European markets and global migration flows. And the sovereignty of small states is profoundly circumscribed by global finance capital and the EU – even if you detach yourself to join its external periphery. How to disentangle oneself from the EU and global finance, and how to survive outside, but within the sphere of interest of a quasi-empire and on the margins of global flow of financing? Such questions have remained firmly off the agenda of the mainstream middle class independence movement. Even now, after the EU has firmly affirmed Rajoy’s prerogative to “restore constitutional order” in Catalonia, there are messages circulating in the CDR WhatsApp groups saying that if the independence bloc wins the next regional elections, the EU will step in on Catalonia’s side. The inability to raise these the questions and the persistence of the hope that the EU will come to the rescue suggest the disavowal of an awkward truth: the costs, particularly to the middle class, of a clash with the EU. Both the truth and its disavowal suggest the limits of the class base of the independence movement; the middle class turns out to be both its condition of possibility and its condition of impossibility. The politics of national sovereignty do not always narrate its struggle in the epic mode, but when it does, it tends to become Quixotic. To the spectator, the result is invariably farcical, but only the cynic observer laughs without crying. Elevated principles armed only with a weak yet emboldening weapons – majorities, public opinion – clash with a hard, cold reality. Dramatic speeches, tense negotiations, and tactical antics are followed by capitulation, retreat, or rout. Some believe that the unbacked force of democratic mandates might sway mighty EU, others that the benevolence of the EU will save them from the state, and others again that the state can easily discipline global capital. The left tends to be more materialist, but it rarely gets to be the hero. But why would the Catalanist left ally itself with their local bourgeoisie if they knew that it would sell out? For Marx, such tactical alliances existed to be broken, because he believed the popular movement could eventually be victorious without it. The Catalan movement, however, shorn of petty bourgeois and bourgeois leaders and their class constituencies, would be severely weakened. As we have seen, the popular classes in Catalonia are not merely split on the national question, but also overwhelmingly against it. Many have family in the rest of Spain, many speak Spanish but not Catalan, and many simply don’t desire or succeed in finding a place in the affective and imagined community of Catalans. Whether or not these quotidian interests are articulated in the language of Spanish nationalism or in the transversal language of els comuns, these are not people who can be easily won for Catalan independence. If a pro-independence platform had been organized along class rather than national lines, it is reasonable to expect that the anti-capitalists of the CUP would have done that, instead of allying themselves with the traditional party of Catalan capital. The independentist left could not build the social majority needed for a rupture without allying themselves with large segments of the Catalan middle and upper classes. Like their political leadership, we can imagine that these classes fell more easily victim to threats of capital flight and loss of EU membership. Further, CUP’s strategy of winning independence through open struggle presupposed that many middle class Catalans could be radicalized through the experience of open struggle and lessons of bourgeois politicians selling out. So far, with polls giving CUP 6-8% of the vote (a repeat of, or setback from, the 2015 elections), the idea that the middle class might risk its relative comfort for the birth of the republic seems decisively disproven, for entirely unsurprising reasons. The cross class-alliance stood in the way of developing a consistent socio-economic vision that would draw in people and that might mobilize around the concrete political content of a ”social republic,” but not around the epic narrative of Catalan national independence. The aim of forcing a social polarization through political action was to establish the conditions of popular sovereignty and left hegemony, but the project itself undermined an essential condition for popular sovereignty and left hegemony: the political class composition of Catalonia’s heterogeneous proletariat. 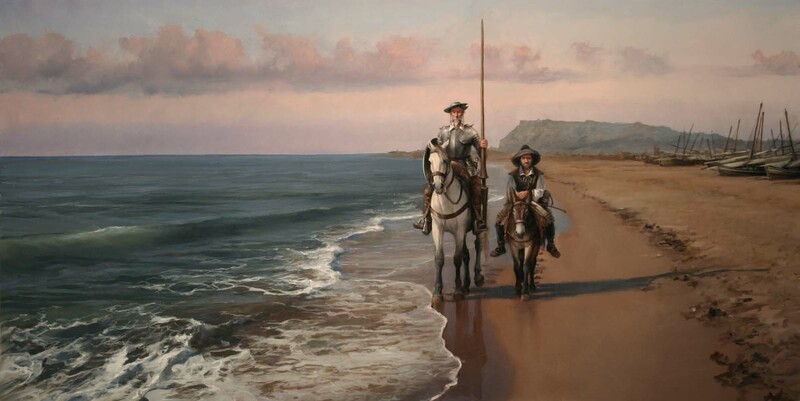 Might it be, paraphrasing Marx, that Sancho has been so infected by his long years of association with Don Quixote that he fails to notice that this “task” of his, this “vocation,” is nothing but the result of his faith in weighty political treaties on national sovereignty? Given the historical romance of radical Catalonia and the experience of the recent Greek struggle against the EU, it is understandable that many on the international left have come to believe Sancho’s version of the epic narrative: that the secession crisis would open towards the construction of a social, anti-capitalist, radically democratic Catalan republic. But “popular sovereignty” without popular power is merely sovereignty, and by dividing the popular classes around the national question, Catalan independentism and the Spanish reaction were undermining the conditions of popular power in the struggle over sovereignty. The political left and civil society would have been strong in this new state, but unless you strongly believe the autonomy of the political and the power of the state and culture, it is hard to see how even an ERC-CUP government in Catalonia could have fortified a social republic in the face of EU and Spanish attacks, and against the material interests of the largest constituency for independence: the Catalan middle class. It seems more likely that the Catalan government would merely have wrested the right to implement the dictats of the EU and finance capital from Madrid, the right to make sacrifices in the name of the Catalan rather than Spanish people. And even if Catalan independence held the recognition of the EU and a solid majority in Catalonia, the weakening of the conditions of class power casts aspersions on the independence project. If estranging ourselves from Sancho’s vision feels like a suspension of hope, it is only because hope in the first place was based on a suspension of doubt. At the time of writing, spokespersons for PDeCAT and ERC are admitting – after having declared a republic – that there isn’t a “social majority for independence.” Instead they say that a majority will have to be established through the regional elections of December 21. 59 Another proxy-referendum, after two referendums and a proxy-referendum. Catalan politics has transformed itself into Groundhog Day, directed by Armando Iannucci of In the Thick of It. Had this struggle been rooted in the everyday exploitation and oppression of people, its fall would have elicited no snicker. Instead, the Quixotic pathos of the mission jarred with its mundane causes, rendering both struggle and defeat farcical. And the likelihood of a social majority seems far off, with polls suggesting the pro-independence bloc will struggle to reach its current vote-share of 47%. With a huge vote increase, the neoliberal anti-catalanist Ciudadanos is set to become the biggest party, while Catalunya en Comú is likely to hold the mandates required for either side to form a government. The Comuns impudently point out ERC, PSC, CUP and Comuns will form a solid left-wing majority, but in the current atmosphere, this is little more than an illustration of the non-alignment of the social and the national question. It is not unlikely that new elections will have to be called, and that Cuidadanos will continue to grow. Beneath this farce, a democratic tragedy is playing out. Many Catalan politicians are currently imprisoned our on bail, while hundreds of mayors – including Ada Colau – face charges for having facilitated the referendum. Catalan institutions are under direct government from PP politicians and bureaucrats who have never won elections in Catalonia. The popular classes and the general population are split. The organic crisis of Spain has manifested itself as a crisis of Catalan society. The events of the Catalan autumn have strengthened Rajoy’s project of closing the interregnum. In the Spanish state, the unilateral process to build a nation state has isolated the Catalan struggle, instead of building an alliance with the Spanish left on a federalist and anti-PP line. The PP, scandalized and weakened before the process, has been able to consolidate its hegemonic project based on authoritarian centralism and Spanish nationalism. In Catalonia itself, the manichean conflict has cut many of the forms of solidarity and class composition that had risen in the crisis and submitted the autonomous popular initiative to a leadership that was bound to demoralize it. Slowly, the economic conditions for a new order are coming into being. The negative GDP-growth average of 2008-2014 has turned into seemingly solid 3% figures in 2015-2017, though much of this is based on a return to the unsustainable pre-crisis economy based on tourism and debt-financed construction. Spanish unemployment figures are down to 17% from the 2012-13 peak of 26%, but this covers the fact that most new jobs are more precarious and worse-paid than the jobs destroyed in the crisis. Poverty wages and food banks remain common. The new regnum will be built on weaker foundations than the past, and its political and economic reserves will be limited. The middle class is indebted and poorer, its children more precarious, and promises of meritocracy and progress still in suspense. The crisis of legitimacy is not over, and new corruption scandals continue to emerge, some involving payments to an “M. Rajoy.” The principal brokers of the past constitutional compromise, the EU and the king, have been forced to take sides in the current conflict, their positions as mediators decisively weakened. In Catalonia there is no doubt that the situation will remain conflictual in the short and medium term. Catalan autonomy remains suspended, many essential funds frozen, and court cases against politicians under preparation. The contradiction between the prohibition of Catalan nation building and the prohibition of Catalan self-determination remains and has only been intensified. Of the three competing answers, none is currently feasible. Neither authoritarian Spanish centralism, nor independence, nor constitutional reform. Though feared by many Catalans, the re-emergence of Franco-style centralism is unlikely. A full reassertion of Spanish centralism would require much force and risk provoking a Catalan insurrection. It is much more likely that Rajoy will stay content with keeping the Catalan ghost at hand, maintaining a constant, low-key state of exception in Catalonia. Not just because Spain is a democracy today, but also because the Spanish state has learned from Francoism’s failed efforts that regional nationalism cannot be broken, but, at best, managed for political gain. Such a strategy is readily available to the Spanish state, developed through thirty years of repression in the Basque Country. Today we see the beginnings of such a situation, and in light of the EU’s support for the application of Article 155, there can be no hopes that it will play a moderating and mediating role. Contrary to the epic narratives of the singular resistance and oppression of Catalonia, the best reading is not that the EU is allowing Rajoy to be “Francoist.” Rajoy’s authoritarianism, supported by PSOE and Ciudadanos, can be largely understood as a part of a wider tendency to resort to the use of force and political imposition in response to the challenges of the interregnum, particularly their loss of social consensus and political legitimacy. Also CiU under Mas became notorious for using the Catalan police against protesters in the early crisis years. Even the EU itself is increasingly trying to stabilize itself by force and by wielding “the rule of law” against the expression of democracy (apart from violent crackdowns of protest, such as the undemocratic installation of the technocratic governments of Papademos and Monti in Greece and Italy, and the handling of the Greek crisis in general). This is not to deny the specificity of the treatment of Catalonia or the continued presence of Francoist values, impulses and individuals in the PP. But as the epic stays focused on those phenomena, it loses sight not merely of the broader picture, but also of potential solidarities, alliances, and shared fronts beyond Catalonia. Any re-opening of the path towards independence would require a movement willing to use its capacity to render Catalonia ungovernable – a move unthinkable under bourgeois leadership, and minoritarian without it. While maintaining it as strategic horizon, even the hard-liners of CUP have put this perspective off the agenda by accepting participation in the December 21st elections despite their claims that they are illegitimate. And the needed constitutional changes are blocked, as the parties of the 155 have created a reinforced consensus around Spanish unionism. If federalism were to become possible, it would not be because Podemos suggest it, but because a movement enforces costs and instability in which constitutional change will become the lesser evil for the Spanish state – and a way to demobilize decisive sections of the Catalan support for independence. Could a pro-democratic alliance between CUP, Comuns, and Podem finally arise in resistance to the repression and the likely permanence of the limitation of significant parts of Catalan autonomy? And could it find allies in the rest of Spain, especially now that PP figures have started to threaten other autonomous communities with Article 155? 60 In the bitter winter now upon us, the question of alliance seems entirely untimely. Unavoidably so, because time is working for Rajoy’s reign. Society seems to have retreated behind its starting point, and any transformative politics will require the elaboration of a new point of departure. Vamos a aplicar el artículo 15M, says an image circulating in Barcelona. It reminds us of the spring of 2011, rich in the poetry of the future. What remains of this moment beyond nostalgic attachment is prosaic, but indispensable. It is the networks and collective experience of building and undoing power transversally, between or beyond identities and memberships. The experiences live on in the cities, and in the most open forms of Catalanism, vilified or pushed aside in the manichean autumn. The winter of Rajoy’s regnum depends on the undoing of transversality and composition, the repression of those governments that create space for disobedience. As befits epic theatre, we take leave of our heroes without conclusion, without catharsis, without a for-ever-after. What remains, on the request of several readers, is a reflection on the failure of the epic of national sovereignty. The aim is not in order to criticize or defend actions and strategies, but to ask in what sense Marx’s quip about Don Quixote applies not only to the Catalan struggle for sovereignty, but also to the politics of national sovereignty elsewhere in Europe today. The Catalan autumn is the product of a singular conjuncture, in which the tensions of the competing subaltern Catalan nationalism and dominant Spanish nationalisms, the contradictions of the constitution, and the various crises of the Spanish state and the EU all culminated simultaneously. The interregnum objectively posed the problem of a reconstitution of the state, which gave rise to a variety of practices centred on the strategy of establishing or reaffirming national sovereignty. In Catalonia, the strategy naturally adopted an epic register, which is closely intertwined with nation-formation, not so much as an optional propaganda tool, but as an expression of a struggle grappling with “the whole of its age and national circumstances.” 61 Thus, the Catalan independence movement tried to subsume all political questions to the national question, or postpone them until independence was achieved. This genre of politics, with its affective and subjective register – the mix of sentimentality, pathos and focused commitment, the combination of urgency with a spirit of perseverance – and its unwillingness to compose, its strategic disregard for transversality, indeed its monomania, 62 has long been politically useful to national liberation struggles, invoking and cohering a collective subject, conjuring up the heroic courage needed in order to solve the problem of one’s age. But not all ages are heroic ages. The Catalan débâcle is Quixotic in a very precise way: the narrative the hero told about himself failed, to both tragic and comic effect. The conditions seemed to cry out for such heroism, but ruthlessly punished it. As Althusser points out, ”the possibilities and limits of the nation’s realization depend upon a whole series of factors … which in some sense prestructure the aleatory space in which the nation will be able to take shape.” 63 Objectively, many of the factors that made previous wagers on struggles for national sovereignty timely (a multipolar world system, the feasibility of guerrilla struggles or civil war, the relative economic self-sufficiency of populations in mainly agricultural economies, the capitalist need to produce integrated national markets where there were none, etc.) are not present. For these reasons, the Catalan government came to rely on the most formal and ideal means of the epic of national liberation: the demands for self-determination, a republic, and national sovereignty, and the weapons of majorities, referenda, and representative democracy. With this armory, the goodwill of the enemy or its imperial masters became a condition of liberation. In its most radical moments, the Catalan independence struggle has seemed close to epic: from the civil disobedience of more than two million voters, over the self-organized local defense committees and strikes to demonstrations that habitually count hundreds of thousands. If the Catalan struggle arrived at the threshold of the epic, it was because it built on the transfiguration of the world that was begun negatively by the crises, and positively by the social movements and moved sociality of 2011. The independence movement, by its very definition and by the intransigence of the Rajoy government and the constitutional court, had to pursue an epic narrative towards manichean struggle. Similarly to Podemos’ project for national sovereignty, the independence movement drew energy from the constituent powers of the 2011 movements, and enjoyed the political space created by their destituent power. Selling themselves as competent and just reformers of the state, Podemos’ rise contributed to the partial demobilization partial institutional turn of the movements. In Catalonia, the epic struggle continued mass mobilizations and action, but in a way that split many of the networks and solidarities of 2011, undermining the transversality and class character of that cycle. Where Podemos aimed to run the state, Catalan independentism wanted to found one in continuity with the Catalan Generalitat. In either case, the attempt to built national sovereignty was prioritized to the detriment of what we can vaguely term popular power. This wager on the autonomy of the political and the transformatory capacities of government did not come naturally to the assembly based CUP or Podemos. 65 Rather, the orientation towards the institutions responded to a clamour from the largest demographic to demand change in the crisis: the indignant middle class. The Catalan politics of national sovereignty are not unique in relying on a mostly middle class base. In fact, it seems the politics of national sovereignty both pre- and post-crisis, both right- and left, find its energy from a particular middle class experience: the fear of declassing, the loss of security, the defence of rights, a sense of loss of control. In Northern Europe, indignant nostalgia, especially in provincial areas, has been a fertile ground for the nativist and xenophobic parties since before the crisis, and for the welfare chauvinist turn of Danish social democracy. In Spain and Catalonia, the experience of mass solidarity of the 15M has allowed Podemos and Catalan independentism to organize the middle class around more progressive, but competing visions of national, popular sovereignty. The concept of national sovereignty only exists politically in singular constellations with other concerns, orientations and conditions, and therefore we cannot meaningfully talk of one ideology, as liberal critics of “populism” do (though their generalized contempt reveal one common feature: everywhere, the concept of national sovereignty has not come onto the agenda in Europe today as an ideology of the current order, as much as a demand from insurgent parties and movements). Certainly, the concept of national sovereignty does have its own abstract operativity and appeal, which produce different but comparable effects in the different contexts it is deployed in. The notion of sovereignty offers the state as an orderly, parliamentary shortcut to change, appealing to those whose political desires rarely venture beyond a wish for good government and governance. The national binds sovereignty to a community that is sentimental and produced by state and ideological institutions (the school, the media, etc.). Imagining the productive economy as a common national household, the concept of national sovereignty at most offers a critique of the supposedly “unproductive”: financial capital, tax-dodgers, and/or migrants and the unemployed. 66 The politics of national sovereignty might provide for electoral success, but they contribute to the closure of strategic reflections on the multiple crisis of capitalism and the state. The clamor for national sovereignty requires a belief in a good state, not as a product of struggle, but as an outcome of elections. National sovereignty is the spontaneous political philosophy of the crisis of the middle class, the clamor of those who used to live comfortably, in the forgetting of the struggles that won the relatively comfort, as an always insufficient concession. Those who speak of national sovereignty might take it to mean popular sovereignty, but it mystifies the fact that if such sovereignty were to be possible at all, it would be based in autonomous class power. Even national sovereignty would only be possible on the base of mass support – in opinion and in organized practice – for a rupture with (or within) the EU and with international finance. If all this is not on the agenda, it is not so much an affliction of consciousness, as a limitation of contemporary social reality in Europe. In this period of constant low-intensity crisis and decomposition of the middle class, its expectations and attachments will continue to be reproduced under threat of declassing, in a state of anxiety. Indignation and the demand for good governance and government will persist, and so will the challenge of politicizing them differently than the forces of reaction. Autonomous counterpower cannot be built on middle class subjectivities, but it can only grow into mass organization through the transformation of the middle class. Some of the tools lay scattered in the dust of the battle of Catalunya: the “perverse governance” of the cities, and the transversal organizing of 2011. 1. ↑ This article exists thanks to Carlos Delclos’ insistence I could write it and thanks to ongoing conversations with Manuela Zechner during the month of caseroladas. It has been improved by suggestions from Carlos Delclos, Oscar Reyes, Andreas Mulvad, Adrià Rodríguez and Tim Savage, and editorial work by Evan Calder Williams and Ben Mabie. 2. ↑ Long ago, Aristotle suggested that praxis has a narrative structure, which helps the subject apprehend the conditions of its actions and inscribe them into a meaningful, temporal sequence. Daniel Hartley, The Politics of Style (London: Brill, 2017), p. 170. 3. ↑ To be precise, Quixote much like Catalan independentism until recently, was not trying to live out an epic proper, but a romance, a more minor heroic genre. The romance, especially in the form of the picaresque, is the genre of valiant losers, while the epic is the genre of history’s winners, most paradigmatically of founders of nations and states. The failure of an epic wager, of course, is even more tragicomic than the failure of a romance. But since the habitual genre of Catalanism is the romance, the narrative resources are at hand for transforming embarrassement into a narrative of honerable defeat. See Fredric Jameson’s discussion of David Quint’s Empire and Epic, in Valences of the Dialectic (New York: Verso, 2009). Thanks to Daniel Hartley for drawing my attention to that passage. 4. ↑ “‘El Quixot és la traducció d’una obra catalana, d’en Joan Miquel Servent’.” Institut Nova Història. 5. ↑ Karl Marx, Capital: A Critique of Political Economy, vol. 1 (Harmondsworth : Penguin in association with New Left Review, 1990), p 176. 6. ↑ The crisis of early 17th Century Spain had one important similarity with that of today: it had its root in the failure of a globally integrated speculative economy in what was presumed to epitomize “real” value (then silver, now real estate). “The crisis of consciousness was just as acute as the factual crisis,” writes the Annales historian Pierre Vilar. The secure foundation under political and economic thought having slipped, it was hard to come up with realistic solutions. This unproductive economy produced a number of social ills, from declassing to banditry to a veritable frenzy of epics and romances celebrating the pursuits of a more heroic past. Pierre Vilar, “The Age of Quixote,” in New Left Review, I/68, July-August 1971. 8. ↑ A simple google-search for “Catalunya farsa tragedia” reveals well more than a dozen texts with that phrase. 9. ↑ Marx described the farce of bourgeois revolutionaries fighting the limited battle of their time surrounded by the heroic phrases and costumes borrowed from 1789. What was once the poetry of the future, was now a poetry of the past. Apart from the blatant mismatch between the content and the form of the struggle, there is the disjuncture between a past elevated and pillaged for its radicalism, and a present which is decidedly less radical. 13. ↑ Of course, most immigrants in Catalonia are familiar with such linguistic and cultural non-recognition and pressures for “integration,” especially in relation to the dominant culture in Catalonia. 14. ↑ It’s important to nuance these two points, that are often used to make unhelpful comparisons with the separatism in rich Northern Italian regions such as Lombardy. Firstly, the relatively economic weight of Catalonia has declined over the last three decades, with the region slipping from having the second highest GRD (gross regional product) in Spain to fourth place. Also, economic nationalism has declined in importance in the Catalan independence movement over recent years, with Puigdemont rejecting the slogan that Espanya ens Roba (Spain robs us), and his coalition, JxSí promising to make substantial transfers of money to Spain over a number of years to smoothen the separation. 15. ↑ Andrew Dowling, “Accounting for the turn towards secession in Catalonia,” International Journal of Iberian Studies, Volume 27, Numbers 2-3, 2014. p. 220. 17. ↑ Dowling, 2014, 228. 18. ↑ The draft preamble boldly defined Catalonia as a “nation,” which was considered unpalatable in the Cortes. Instead, the agreed preamble stated that the Estatut recognizes that the Catalan parliament has defined Catalonia as a nation by an ample majority. 19. ↑ The Estatut was also challenged by Defensor del Pueblo (the Spanish ombudsman) and other autonomous communities. Dowling 2014, 226. 22. ↑ For a discerning economic analysis of the Spanish crisis and its causes, see Isidro López & Emmanuel Rodríguez, “The Spanish Model,” New Left Review, 69, May-June 2011. 24. ↑ Colau & Alemany, Mortgaged Lives, Joaap 2014. 26. ↑ In a technical sense, most of the “middle class” is proletarian, as it does not control the means of reproduction, a predicament that is mostly dealt with through wage labor. However, through education and meritocracy it expects to be paid well enough to eventually mitigate or exit from that condition through homeownership, entrepreneurship, and other forms of investment. Middle class thus principally names a subjectivity and a set of strategies of life, which may be more or less in sync with economic realities. 27. ↑ Javier Toret (ed): Tecnopolítica y 15M, Universitat Oberta de Catalunya. 29. ↑ Emmanuel Rodríguez, La política en el ocaso de la clase media - El ciclo 15m-Podemos. 2017. Traficantes de Sueños. 31. ↑ Mas, in What’s up with Catalonia? : The causes which impel them to the separation, ed. Liz Castro (Ashfield, Mass. : Catalonia Press, 2013), 11. 32. ↑ As pointed out by Ronald Fraser, “Spain on the Brink,” New Left Review, I/96, March-April 1976. 34. ↑ The heads of ANC and Òminum - the two Jordis, Sànchez and Cuixart - became the first political prisoners in the current secession crisis when they were arrested this October 16th, charged with organizing peaceful but civically disobedient demonstrations. 35. ↑ In a long term perspective, Catalan independentism can be understood as a failure of Spanish nation-building, as pointed out by Luke Stobard. “Catalonia: Past and Future,” Jacobin, October 10 2017. In the early 19th century France, like Spain was a multilingual state. But whereas the French state was capable of subsuming or marginalizing local languages with its expanding wealth and power (industrialization, colonialism, and reforms forced by revolutions), the declining and increasingly backward Spanish Empire was unable to build a modern, linguistically homogeneous nation state. See also Ronald Fraser, “Peninsular Mythologies,” in New Left Review, 55, January-February 2015. 38. ↑ Previously referring to people of “good stock,” i.e., the aristocracy, casta is now used more extensively, most centrally in the discourse of Podemos, to refer to the business and political elites, sometimes taken to include trade union leaderships, invoking ideas of corruption, influence peddling, and clannish closure. 41. ↑ Emmanuel Rodríguez, La política en el ocaso de la clase media - El ciclo 15m-Podemos. 42. ↑ Emanuel Rodríguez, “Podem-Podemos o la oportunidad perdida en la ruptura catalana” in Ctxt, November 8 2017. 45. ↑ About 363.121, or 22.6%, of the residents of Barcelona have been born outside of Spain. The number of registered non-Spanish citizens living in Barcelona was 262.233 in January 2015, or 16.3% of the population. These are people who could not vote in the independence referendum nor in Spanish general elections. http://www.bcn.cat/estadistica/angles/dades/inf/pobest/pobest15/part1/t11.htm. On that theme Fàtima Aatar wrote “Many migrant and racialized people saw the construction of the Catalan Republic as an opportunity to get rid of the Law that chained them. However, the first surprise came when the electoral census for the referendum did not incorporate residents. That is, those people not nationalized by the Spanish Immigration Law could not exercise their (non)right to vote in the referendum. But the big surprise was manifested by the Transitional Law presented to Parliament, which did not incorporate migrants. We can say that during the drafting of the Transitional Law they made a copy-paste of the Spanish Immigration Law changing “Spanish nationality” by “Catalan nationality,” so that whoever obtains Catalan nationality will be the one who previously had the Spanish.” Fàtima Aatar, “Desobediència?”, La Directa, September 29 2017. 46. ↑ Knowing that their pro-independence majority isn’t secure, many independentists consider any party that doesn’t openly campaign for independence as de facto anti-independentist. The Spanish unionists, equally unsure they would win, consider a referendum an unconstitutional opening of the door to secession. 47. ↑ Roger Palà, “Set dies de juliol que haurien pogut canviar-ho tot: de la ‘llista sense president’ a Junts pel Sí,” El Critic, September 25 2015. 49. ↑ A symbolic photo to mark that brief moment, was that of CUP’s David Fernàndez and comuns’ Xavier Domènech hand in hand at a demonstration in Plaça Catalunya. 52. ↑ La Vanguardia, November 6 2017. 53. ↑ This unease at critique reveals a certain insecurity of the nationalist project, very far from Marx’s ideal proletarian revolutionaries who “constantly criticize themselves, constantly interrupt themselves in their own course, return to the apparently accomplished, in order to begin anew.” Marx, 18th Brumaire. 54. ↑ The street vendor’s letter in critical support of the independence movement is worth reading in full. For background on the movement, see Carlos Delclos, “The Street Syndicate: Re-organizing Informal Work,” Roar Magazine. 55. ↑ “La mayoría de catalanes es favorable a que se convoquen elecciones,” El País, October 30 2017. 56. ↑ “El apoyo à la independencia tiene raíces económicas y de origen social,” El País, September 28 2017. 57. ↑ BBC Mundo made a short but telling portrait of the inhabitants of the poor Ciutat Meridiana neighbourhood in Barcelona. 59. ↑ “Minuto a minuto - la crisis Catalana,” El Diario, November 14 2017. 60. ↑ Enric Juliana, ‘Coerción Para Todos’, La Vanguardia, 23.10.17. 61. ↑ Hegel himself already proposed that the epic world had been replaced by a “world of prose,” as the organization of life as a totality of experience was replaced by middle-class individualism. Hegel, Lectures on Aesthetics. Part 3, Section 3. Fredric Jameson, Marxism and Form: 20th-Century Dialectical Theories of Literature (Princeton: Princeton University Press, 1974), 352. 62. ↑ At some point, it seemed fitting to end this windy text with Cervantes’ reflection on the failure of epic (and picaresque) heroism as a form of practice. As an ironic gift to Bilbeny’s Catalan Quixote, the unfortunate hero’s end is symbolically set on the beaches of Barcelona. There, Quixote was finally forced to cease his knight errantry, when he is challenged by a disguised knight. Convinced that this anachronistic duel is a joke, local dignitaries joyfully abide to the charade, and witness to Quixote’s solemn oath that he will give up his errantry if defeated. Our hero is duly defeated. Previously, friends, family and others who refused to be enrolled in Quixote’s narrative had failed to stop it. The masked knight who succeeded was none other than Quixote’s friend Sansón Carrasco, who entered his narrative in order to tear him from it. The lesson from Quixote’s end, as I take it, is a lesson about how epic narrative totalizes its world, and refuses any critique from outside. The epic hero commits himself obsessively to his singular pursuit, and if reality fails to accept his ideals this only demonstrates to him the urgency of his mission. The hero enlists everyone who is not an enemy as a helper – or reduces them to spectators. Anyone who tries to sow doubt and dissuade is an obstacle. Quixote might be idealist, but it would be cynical to blame his idealism. Quixote might have lacked materialist analysis, but so did the world he struggled against. Quixote’s failure was a failure of the epic genre itself, of its monomania, its unwillingness to compose, its strategic disregard for transversality. Had Quixote pursued what Marx describes as his ”love for humanity” in a less epic mode, he would have made common cause with – rather than posed as the saviour of – the wretched of the earth. Engaging in struggle with others, his analysis would have been more materialist and his mission less lonely. 63. ↑ Althusser, Machiavelli and Us (London: Verso, 2011), 11. 64. ↑ Jameson, Marxism and Form, 178. Lukács, Theory of the Novel (Cambridge, MA: MIT Press, 1971), 152. 65. ↑ After the disappointing 2016 election, Podemos’ Pablo Iglesias, who anecdotally was an organizer of solidarity travels to Chiapas in the early 2000s, reaffirmed the need to construct social counterpowers. 66. ↑ A useful rule of thumb to distinguish right and left-wing politics of national sovereignty is the following: for the left, the culprit is only finance capital and tax dodgers, for the right it is only the unemployed and migrants, and for the extreme right it all of those. Bue Rübner Hansen is a postdoctoral researcher and member of the editorial collective of Viewpoint.